This beautiful barn-style greenhouse gives you a year-round growing space in an attractive, heavy duty aluminum frame and 10mm twin-wall panels. Engineered to perform in harsh environments. The Grandio Elite's rugged durability, makes it the most insulated of the greenhouses on the market and it's barn shape design is both elegant and functional, and allows plenty of growing space. 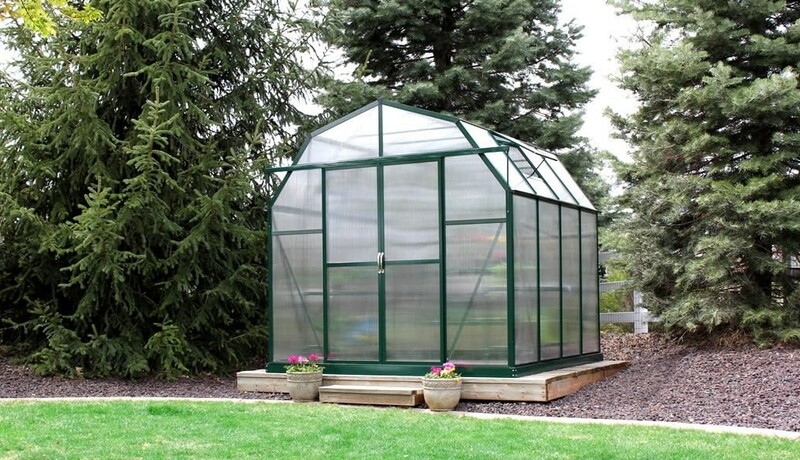 Made to meet the highest standards of amateur and professional gardeners, the 1.6mm profile aluminum frame provides a stronger and more durable build than its competitors and won't warp, melt, or crack like the PVC-based barn-style greenhouses. And the heavy-duty construction coupled with 10mm twin-wall polycarbonate panels provide and the perfect thickness for winter insulation. A wide range of features and accessories culminates in a well ventilated growing space with gliding double doors, our superb easy-to-assemble system, and an insulation (R) value of 1.89* and heat loss (U) value of 0.53 resulting in an amazing gardening and greenhouse experience. Panels: 10mm twin-wall UV protected polycarbonate.